Courage is an inner resolution to go forward despite obstacles; cowardice is submissive surrender to circumstances. 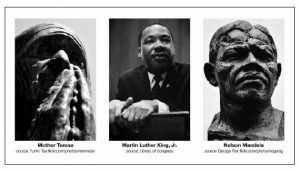 — Martin Luther King Jr.
Ah, the timeless and heavily influential question: Which picture should you select for your facebook profile? I mean, this is the photo with the best chance at garnering your greatest number of “likes” so you really don’t want to blow it. But as farcical as I may have been there, actually, there are a lot of inferences we make about others based purely on their looks (e.g., The Halo Effect), inferences that can have profound consequences for the person we’re judging. And in a digital age where a picture of your face is often associated with everything you do, choosing the right one can therefore be quite impactful. When saying “up and to the right,” I’m talking about the viewer’s perspective. So see, maybe there is something to choosing the right facebook profile pic. However, in a study published just last month, researchers wanted to know if an odd pattern from everyday life was simply coincidence or something more persistent; that is, pictures of moral leaders (Martin Luther King Jr., Mother Theresa, etc.) tended to feature them looking up and to the right. To first test this intuition, the researchers surveyed over 150 people for the five most common moral heroes (MLK, Mother Theresa, Nelson Mandela, Gandhi, JFK), and the five most common celebrities (Brad Pitt, Marilyn Monroe, Elvis Presley, Michael Jackson, Charlie Chaplin). With this list, the researchers then selected the first 120 photos that came up for each in an image search, and subsequently coded them by the direction of their gaze. And as the researchers had suspected, moral leaders were significantly more likely than chance to have a picture of them facing up and to the right, and twice as likely as celebrities to have that pose. However, to test this more empirically, the researchers conducted another study wherein participants saw nine different photos of a young man (i.e., facing up and to the left, up and straight, up and to the right; flat and to the left…etc.) and then selected the picture that either 1) best conveyed a portrait for the leader of a social cause, or 2) a successful job applicant. And once again, when selecting a moral leader, participants chose the photo with the face turned up and to the right. Later studies revealed that this posture lead perceivers to assume that the target was warm, proud, and future-oriented—traits comprised in a good moral leader. However, this still doesn’t answer why people make those attributions in the first place. Which of the four figures represents how you perceive time? The researchers found this posture effect only for those who viewed it as moving from left to right. Now, the paper itself doesn’t present any firm evidence to explain this, but there is speculation that it has to deal with conceptual metaphors. That is, because most Americans (the nationality of the participants) imagine time moving left to right, when they see the person looking up and to the right, it automatically activates this “future-metaphor” and we unconsciously ascribe future-mindedness to the individual. But still, this doesn’t explain the increased warmth or pride or why simply looking right period (be it up, flat, or down) doesn’t produce the same effect. Relatedly, in filmmaking, heroes are often introduced on the screen from left to right; that is, because English is read left to right, it’s a more natural eye movement for us to follow them this way. In contrast, villains are often introduced right to left, because this is less natural and thus creates subconscious discomfort toward the person. So maybe that’s related here? Regardless of why it happens, the effect is there, and although you may think this an inconsequential finding, consider the upcoming political campaign. Even tiny “nudges” in approval can have cascading effects for candidates, and being more greatly perceived as a moral leader would improve anyone’s campaign. Yet surprisingly, the majority of politicians have their photos taken while facing the left or straightforward. So if you, dear reader, have a preferred candidate in mind, maybe consider referring them to my blog. Frimer, J. A., & Sinclair, L. (2016). Moral Heroes Look Up and to the Right. Personality and Social Psychology Bulletin, 0146167215626707.